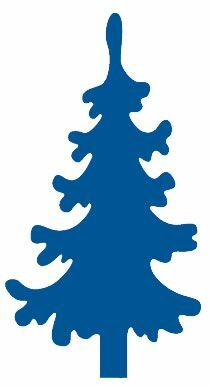 A Marianne Creatables Christmas tree die cutting stencilmeasuring approximately 5 x 9.5cm. This die cutterwill cut a perfect Christmas tree silhouette every time, decorate it with pearls and crystals for a traditional festive look or leave it plain for a more subtle outline. Compatible with most major brands of die cutting machine, can be used on card, paper, acetate and fabric.